We’re constantly on the lookout for the newest, emerging Flea Pest Control Products and Services. Why not sign up here and be notified as when we’ve updated our offerings? You can use this handy form to the right. If you have a specific question about any of our Services or the products we use feel free to contact us, we’re here to help you stay flea free! We believe in informing the customer and allowing them to make an informed decision. This information is by no means exhaustive. If you have any flea questions that you don’t see covered here please feel free to use our handy form or give us a call. Cat Flea: The most widespread flea in homes. Also attacks dogs, wild animals and people. 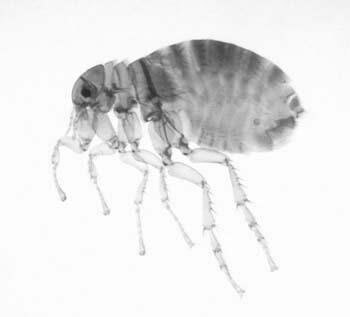 Human Flea: Especially common in warm regions, where it attacks dogs and wildlife, as well as people. Northern Rat Flea: Mostly found on rats, mice and opossums, but it also attacks people and is common in some cities. Chicken Flea: Common pest of fowl, but they are also found in nests of wild birds, including sparrows and starlings. People may be attacked by chicken fleas from bird nests on or in buildings. Oriental Rat Flea: Oriental Rat Flea: Often found on rats in seaport towns. It also attacks house mice, cottontail rabbits, California ground squirrels and people. It is one of the most common carriers of plague from rodents to people. Other pest species include Dog Fleas, Squirrel Fleas, Chigoe Fleas and Sticktight Fleas. Unlike most adult fleas, which spend only a short time on their victims while feeding, chigoe and sticktight fleas stay attached most of their lives. 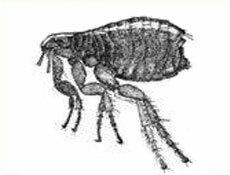 Fleas have a flat body and backward-pointing spines which help them more easily between the hairs or feathers of their victims and make it hard to dislodge them. Experts identify different species by the number and position of spines on the head and body of adult fleas. 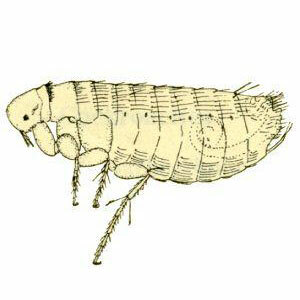 Adult fleas avoid daylight but like warm areas and are attracted by the warmth and movement of their victims. They lay hundreds of eggs which hatch into whitish, maggot-like larvae in or near the nests and resting areas of their victims. These larvae burrow in nest debris or nearby soil to find food and to avoid light and desiccation. Indoors, flea larvae find similar conditions in pet bedding or deep in the pile of carpets. What Can You Do Against Fleas? Outside every home there are wild rodents, birds, bats and other animals which are parasitized by fleas. When these nest on or near the home, there is a risk of flea invasion, particularly when the infested animal dies and the adult fleas seek alternative hosts. When homeowners keep cats or dogs, the risk is even greater because such pets easily pick up fleas from wild animal sources outdoors, or when they mix with other pets at veterinary clinics, pet shows or neighboring homes. However, the fact that fleas are such a common pest does not mean they should be tolerated. Even if you are not particularly disturbed or irritated by fleas, control measures are necessary because of the disease risks and the distress caused to pets and visitors. These control measures must be aimed not only at existing adult fleas, but also at sources of new fleas, particularly larval development areas on the premises. 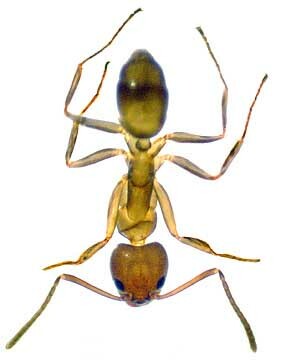 Finding and dealing with these sources is essential to prevent immediate reinfestation, but it requires special knowledge and is best handled by professional pest control operators. However, here are 10 measures you can carry out or arrange that will reduce any existing problems and make it harder for fleas to become established in your premises. Keeping your pets indoors (or having no pets at all) is the most effective and economic method of avoiding fleas being brought into your home. Where pet dogs go outside, try to minimize their contact with infested animals by keeping them on a leash and fencing yards. Remove bird nests which are a close source of fleas (e.g. from gutters, eaves, etc). Screen or seal foundation vents, chimneys, crevices, etc. to keep out flea-bearing mice, squirrels, raccoons, chipmunks, bats, etc. Pay particular attention to crawl spaces. Keep lawns cut short and eliminate weedy areas in order to create the dry ground conditions which discourage flea larvae. Eliminate carpets or rugs which are difficult to clean (e.g. some shag rugs) or have them regularly cleaned by professionals. Vacuum thoroughly and regularly all areas of your home visited by pets and those places where dirt accumulates (e.g. edges of fitted carpets, under cushions on sofas, under heavy furniture, pet resting areas). This will particularly remove flea eggs, adults and larval food. Immediately dispose of the vacuum bag outside. Where pets are a main source of fleas, regularly wash pet bedding to destroy immature stages of fleas. Pets subject to flea attack should be regularly treated with products specifically approved for use on pets. Bathe your pets after taking them to a vet, groomer, pet show or other potential source of fleas. Fleas are highly advanced insects which are adapted as adults to live as parasites, sucking the blood of mammals or birds. Flea larvae are not parasites. Instead, they scavenge on organic matter, particularly dried blood in the excreta of adult fleas, which is found in the burrows, lairs, or nests of wild animals, or in carpets or pet bedding indoors. There are more than 2,000 different species of fleas, the majority of which live in the burrows and nests of wild rodents. Most species of fleas parasitize more than one type of host animal, and some of these fleas can also attack humans. When adult fleas feed they inject an anticoagulant saliva to stop the blood clotting. This saliva can be infected with disease organisms which then enter the victim. Fleas transmit disease organisms between infected wild animals and people, particularly in ports, wildlife parks and recreation areas. In the U.S., these diseases include plague, murine typhus and tularemia. Fleas transmit harmful organisms between pets and people, especially tapeworms. Flea bites can cause severe skin reactions in humans, including “hives”, particularly after repeated attacks by fleas. Fleas on pets can cause dermatitis, tapeworm infestation, anemia and personality changes. Fleas are responsible for about 40 percent of all small animal veterinary effort. Fleas can survive long absences of people and pets because newly formed adult fleas can remain dormant in protective cocoons for 6 months or more until returning animals or people stimulate them to emerge and attack. If you’re interested in the Flea Pest Control Service offered by Termite Terry please feel free to call us at 949-631-7348 in order to set up an appointment or use our online Order Form and we’ll get back to you as soon as possible.